attempt to undertake an act of self-criticism. hear about the stalled post-Soviet motorcade. good will it do him? I am not sure when I wrote the above poem, but I know I read it at one of many offsite readings I have participated in at MLA. This was, it turns out, the one where X— dove across a grand piano and cut Y—'s necktie with a pair of scissors. For that reason, there is probably no memory of my having read this poem, though it got a laugh. This action was, I thought then and still believe, a terrible violation of personal space in the name of—what? An attack on the institutions of poetry? A restaging of the avant-garde as belated and useless? A product of the marriage of convenience of art and power? Likely a bit of the latter, pointing out and criticizing the continuing fantasy of the union of two kinds of literary value—collective and institutional—with the boom-and-bust of the academic market, and its totalizing anxieties, as backdrop. Now back from MLA, I can submit my report on the state of collective fantasy. Again I participated in an offsite reading ("The Vulnerable Rumble," organized by Laura Goldstein, Jennifer Karmin, Laura Mullen at Outer Space Studios, sponsored by the Red Rover Series). As a site of collective fantasy, the state of poetry is good: some twenty performers were given a minimal set of instructions on how to stage a two-hour collaborative performance, with no rehearsal and much trepidation, and it worked. What was really impressive was the montagelike sequence of entrances, interruptions, dissociations, and exits that framed each individual, or group, routine (the vaudeville element was marked). Twenty poets and an audience of a hundred or more made this possible by really listening to the cues, ironies, and gaps of the performance; poetic content was produced, as it were, out of airy nothing. 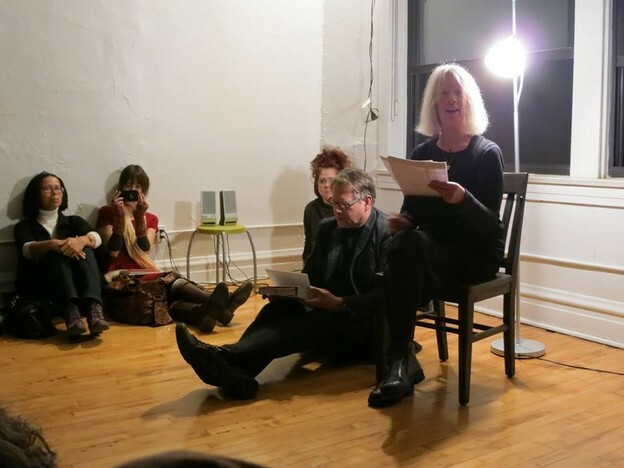 My interventions were these: one a staged duo with Lyn Hejinian, where she read a page of poetry loudly and with dramatic emphasis, while I mumbled a paragraph on Amiri Baraka (here), while sitting on the floor next to Lyn. Having done with that, I rose to present a mini-essay on David Letterman's segment Is This Anything? (here), which I hoped would be used as a question to be asked of the performance as a whole. Later, and after a lot of great performances that truly were something, I felt moved to break into song ("Beyond the Horizon," by Bob Dylan), followed by an attempt to narrate my meeting Dylan as a sixteen-year-old, all those many years ago (here). The generational politics of this proved to be too much for several performers; two surrounded me physically and one attacked me verbally, right in my ear, with some high-pitched noise that did, in fact, shut me up for a second. "MLA Dream," copyright (c) 2014 Barrett Watten.